A massive Israeli police force raided the Palestinian neighborhood of Bayarat Shannir inLydd, a city in present-day Israel, on Tuesday morning. Armed to the teeth and accompanied by bulldozers, hundreds of police officers stormed the neighborhood and sealed all entrances. 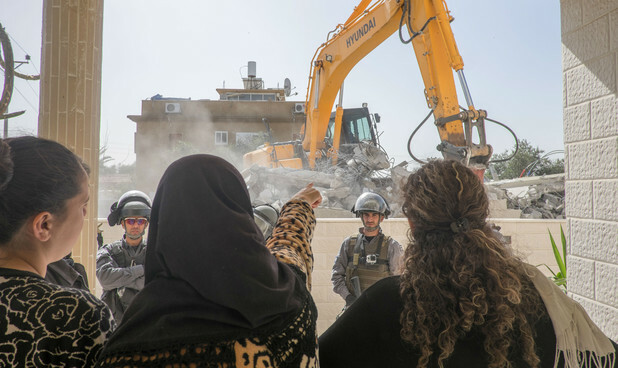 At 10am, the police demolished the home of Hana al-Naqib, a mother of four, saying that it was built without a permit. Hana and her children, aged 7, 8, 14 and 15, were violently expelled from their newly-built home, as were the neighbors who came to support them. Daoud, Hana’s eldest son, is used to being awakened by his mother every day at 7am for school. On Tuesday, however, it was police with rifles pointed at his face who pulled him out of his bedroom. Instead of going to school, Daoud and his siblings were thrown outside into the cold with their mother. This comes less than two weeks after the partial demolition of another Palestinian family’s home in Lydd. Israeli bulldozers destroyed parts of Ahmad Dabbour’s home on 1 February, but the demolition was suspended after the family’s lawyer pointed out a legal flaw in the demolition order. Some fifteen kilometers southeast of Tel Aviv, the historic Palestinian town of Lydd was the site of one of the worst episodes in the Nakba, Israel’s 1948 ethnic cleansing of Palestine. In July of that year, some 50,000 Palestinians were driven out by Zionist militias and expelled to the West Bank. Many died from exhaustion and dehydration on the way. Ongoing demolitions of Palestinian homes in Lydd are part and parcel of right-wing mayor Yair Revivo’s war against the city’s indigenous Palestinians. But those who seem to be the most systematically targeted and pay the heaviest price are often women. “Every demolition is a crime, but destroying the home of a single and unemployed mother who couldn’t even afford the money to hire a good lawyer is a double crime,” says social worker Samah Salaimeh. She is the director of Na’am, a feminist organization that works with Palestinian women who live in the central towns of present-day Israel. “You cannot take away gender from this equation,” she said. “Women like Hana are the easiest target of the Israeli authorities. They stand on their own against an entire army of police, bureaucrats and judges, with neither the money nor the power to stand any chance of winning,” Salaimeh told The Electronic Intifada. Salaimeh herself was first prevented from entering Bayarat Shannir to stand with Hana and her children during the demolition as the police closed entrances to prevent solidarity actions in other parts of the city. She eventually managed to sneak in — and the scenes she witnessed were painful beyond description, she said. Hana al-Naqib’s home was built on land privately owned by her father and acknowledged as the family’s private property in the Israeli state registry. “My family, neighbors and other generous people from the city provided me with the money to help build this home,” a weeping Hana told The Electronic Intifada. “We moved [in] to it three months ago. It was the first time that the children could enjoy a semblance of privacy and stability, to have a place they could call home. But as you see, our happiness was short-lived,” she said. After years of residing with the four children in one room in the house of a sibling, or living on rent which she couldn’t afford, Hana thought life had finally begun to treat her well. But now she has to brace her traumatized family for another round of insecurity. “After they demolished the home, I tried to lift my children’s morale and motivate them to study harder and do well at school. But all the hopes of a better future that his home restored to them have been squelched and bulldozed along with it,” she said. Speaking to a Palestinian radio station based in Nazareth, a spokesperson for the Lydd municipality denied that the demolition has anything to do with nationality, insisting that it targets all “illegal” construction regardless of whether the home belongs to a Palestinian or an Israeli family. The home of Maha al-Naqib, Hana’s neighbor and a former opposition member in Lydd’s city council, is also slated for demolition. Maha strongly disagrees with the municipality’s explanation. “Home demolitions in Lydd are a policy designed to target Palestinian citizens. These are people who have been living on this land way before 1948 but when they want to build or expand, the municipality refuses to give them permits on a racist basis,” Maha told The Electronic Intifada. What is happening in Bayarat Shannir is a naked manifestation of Israel’s apartheid policies. For twelve years, the Palestinian neighborhood has been encircled by a concrete wall, 1.5 kilometers long and four meters high, to separate it from the nearby Jewish colony of Nir Tzvi. Sections of the wall were destroyed by unknown persons back in May 2013, echoing the actions of Palestinian activists who tear down sections of Israel’s wall in the occupied West Bank. Israel’s response is similar on both sides of the green line marking the boundary with the occupied West Bank: police stormed Bayarat Shannir and carried out a series of arbitrary arrests. Before July 2014, Bayarat Shannir was designated as “agricultural lands,” which gave a sweeping justification for the denial of building permits. That month it was re-designated as a residential area and a master plan was approved, providing residents with a window of hope. “By carrying out this demolition at this time, when all that was needed to make the homes in [Bayarat] Shannir legal is a technical map drawn by the residents, the Lydd municipality sends an awful message to the residents,” Palestinian attorney Qais Nasser told The Electronic Intifada. Nasser has extensive experience with home demolition litigations. He said that as far as he knew, the family has appealed to the district court, where the case was still pending when the municipality destroyed their home. “The fact that the municipality destroyed the home without even waiting for the ruling of the district court tells you how arbitrary the demolition was,” Nasser added. “On one day you hear the engineer of the Lydd municipality speak with beautiful and flowery words about equality and the need to involve Palestinian residents in decision-making and in the planning of their own neighborhood. But three weeks later, the same engineer approves of the demolition of a home even though there was absolutely no legal obligation to do so,” he explained. 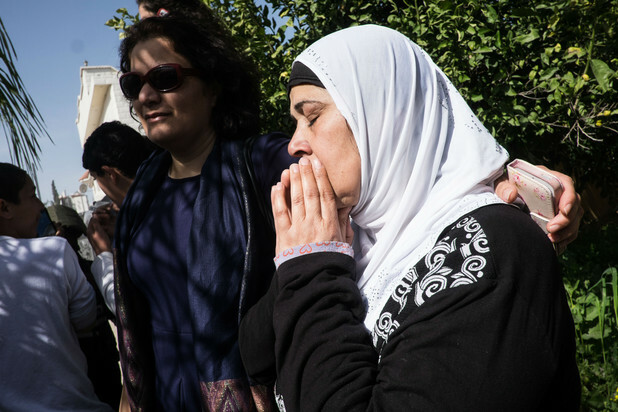 The case of Hana al-Naqib illustrates how Israel uses ostensibly neutral laws as means to legitimize oppression and ethnic cleansing. And it is usually the most vulnerable groups — Palestinian women and those living in poverty — who are mercilessly crushed under the wheels of these laws.